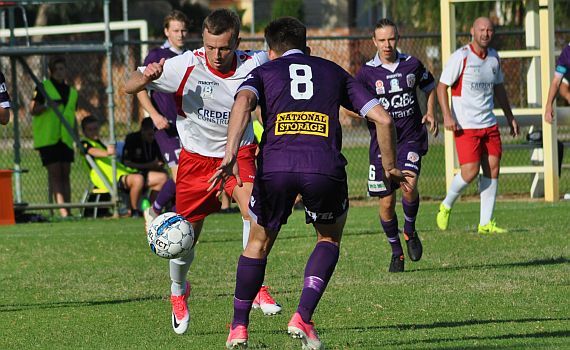 A goal four minutes from time from substitute Keylun Pollard has given ECU Joondalup a hard fought 2-2 draw against Perth Glory in an entertaining PS4 NPLWA clash at the Ashfield Arena. Click here to listen to Head Coach Dale McCulloch and youngster Keylun Pollard chat about the 2-2 draw. The home side opened well and Joe Knowles’s long-range shot was deflected wide, and from the resulting corner Brown-Montgomery headed wide. Knowles tried his luck again from distance on 14 minutes, but Fraser Greenwood was down sharp to save. The Jacks custodian was alert again moments later, this time saving Daniel Stynes’ shot on the run, as the Glory dominated. Pickering’s flick off the line. But the Glory levelled on 29 minutes, when a surging run down the left by Knowles saw him race into the penalty area, and his low cross wasn’t dealt with and McDougall fired home from close-range. Then four minutes later the Glory were ahead. Great work on the right by Kosta Petratos ended with a cross into the box, which ECU didn’t deal with again, and former Jacks striker Brown-Montgomery made them pay, hammering the ball home from close-range to send them into the break with the lead. The Glory almost added a third after the break, a defensive splitting pass from Stynes sent McDougall in on goal, but Greenwood stood tall to save. The Jacks started to take control and Daryl Nicol’s volley flashed over, and the same players’ acrobatic volley flew wide moments later as they pushed for the equaliser. But the Glory were standing tall with Brandon Wilson outstanding in the heart of the defence and Knowles and Jack Leech were everywhere in the middle of the park. The Jacks continued to press, and their pressure was rewarded on 86 minutes with the equaliser. Steven McGarry won possession and fed Keylun Pollard down the left channel, the youngster first touch took him into the box and he finished clinically low past Thurtell. It was a thrilling end to the game with both sides having good chances to win it. First Knowles’ corner was met by Jack Iredale, but the Glory defenders bullet like header flashed inches over the top. Then Jacks substitute James Owen found space in the area, and his snap shot was pushed around the post by Thurtell. From the resulting corner Logan McIsaac’s header was saved by Thurtell, but the Glory keeper kept the best till last. In stoppage time it looked like we would win it, when Amphlett wasn’t picked up on the edge of the penalty area. He drifted past the last defender but Thurtell produced a great one-handed save to deny him and was quickest to react to fall on the loose ball.